Alta4 is an information technology company that specializes in combining geographic information systems (GIS) and Internet technologies to provide innovative solutions for a variety of businesses. Our GIS services include customization, software development, consulting, data analysis, (3D) visualization, and ArcView GIS training. Web services include Web design and hosting, Web database development, dynamic content/PHP, and e-commerce. Based in Germany, alta4 has built up partnerships with companies in Sweden and Austria and is currently looking for partners in the US and Canada. alta4 products are appreciated by a growing number of users in more than 30 countries. Among alta4’s customers are renowned companies, research institutes, municipalities, and counties. 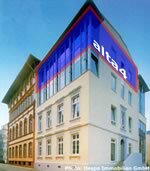 Alta4 has increased sales in 2000 by 500% and has been making profit except for 1998, when alta4 was founded by Carl Jan Keuck, Klaus Görgen and Ole Seidel. alta4 is expecting to increase sales further by another 300% and to double in staff by the end of 2001.